She was admiring her newborn baby’s beautiful eyes when she heard the first blast. Her heart began pounding. She heard additional explosions and the rattling of the windows. She held the baby tight, and then started running from the nursery to the end of the living room. She repeated that several times while shielding the baby with the upper part of her body. She ran to the telephone and dialed her mother’s number. “Maman, did you hear the bomb explosion?” she asked frantically. After leaving the shelter in her uncle’s apartment building, Roxana, along with her mother and brother began walking toward their home. She felt happy that they had survived another night of Saddam’s bombing. It was dark and the moonlight barely helped her to find her path. The government- imposed black out and the deadly silence in the streets had turned every neighborhood in Tehran into a ghost town. Roxana was eager to go back to her room and read her book—Dr. Zhivago. During the nightly bombings, Boris Pasternak’s words comforted her. 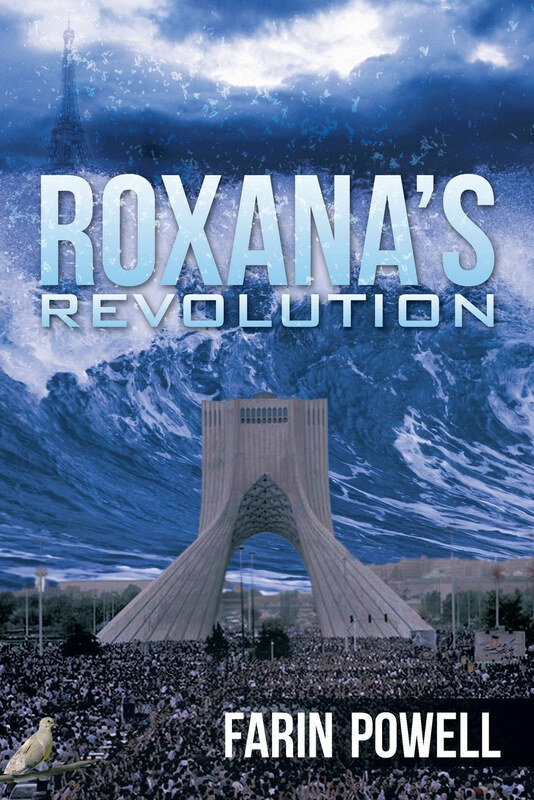 It seemed as if he was describing the Iranian Revolution, when he referred to the Russian Revolution as “a sigh suppressed for too long.” Roxana agreed with him when he said, “Every one was revived, reborn and …gone through two revolutions, his own personal revolution as well as the general one.” She had observed that personal revolution in people she knew. Every one had turned into a revolutionary person in his or her own way. Even apolitical individuals like her mother, her siblings, the neighborhood baker, and the cab drivers. The Iranians’ internal revolution had ruptured like a volcano that had stayed dormant for too long. In a short period of time, Roxana had learned that the revolution—while fascinating and exciting on the pages of a book—was painful to endure. She had not been to the Caspian Sea for more than a decade. She craved to walk on the shores. She asked her husband—Afshin to take her to Ramsar—her favorite beach for their honeymoon. “The water is cold in March. I’ve heard the government has erected a curtain separating men and women,” he said. The government had relaxed their rules on checking the marital status or the family connection of men and women in two areas of activities, climbing mountains and skiing. They could not find enough climbers or ski experts to form inspection squads, but they had easily managed to inspect the beaches. Had the technology allowed them, Roxana thought, they would’ve probably erected walls on the mountains, the ski slopes and the sea, to separate men from women. Ramsar, the most famous resort of the Caspian Sea, sat on the foothills of the Alborz Mountains. The green hills, the palm and orange trees sitting on beds of flowers made it the most charming beach town in Iran. When she walked to the beach and saw the turquoise water of the sea, she felt she that they walk for a while. Despite Den Haag’s unseasonable heat anwas visiting a friend she hadn’t seen for a long time. She breathed the air, and inhaled the smell of the Caspian Sea, a smell that was different from the beaches of Ocean City or Malibu. This was like a familiar perfume of an old friend. Despite the golden rays of the sun shining on the water, it was drizzling. She enjoyed the gentle drop of the rain on her face. She felt like a prisoner who had just got released. She was free to watch the waves of the infinite Caspian Sea, the beautiful sea birds and the shadow of the Alborz Mountains all at once. Roxana killed an Ah. She thought she had left Tehran, the war and the hejab controversy behind. She couldn’t pretend she hadn’t heard the man. Someone had reopened the old wound in her heart. She sighed and looked at the waves, the mountains and the sea birds. Two years later another man—a Dutch in Holland confronted her husband and asked him why he had made his wife wearing hejab on a hot August day. They had finished celebrating her birthday and an award she had won, in a nice Chinese restaurant in downtown Den Haag. After they left the restaurant, Afshin suggested d despite her reluctance to walk wearing a hejab, she agreed. They had not walked more than 50 feet away from the restaurant when a young Dutch man who was walking with his girlfriend stopped Afshin. “Excuse me, sir.” He said as he held Afshin’s arm with a friendly smile. “You see how hot it is? Look at my girlfriend. She is wearing a short and a strapless top. Why are you putting your wife under that long dress and big scarf? She couldn’t help remembering her honeymoon in Ramsar, where a local man asked Afshin why he wouldn’t impose hejab on his wife. She would’ve liked to see the man from Ramsar and the Dutchman from The Hague debate the issue. After hearing the Dutchman’s lecture for a few minutes, Afshin finally walked away.